When you lose someone you love, it’s hard to know where to turn. When someone you love is grieving a loss, it’s daunting to figure out just what to say and do. 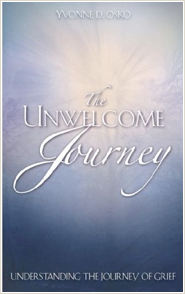 The Unwelcome Journey: Understanding the Journey of Grief provides the answers. If you’ve lost someone, you will find the affirmation and encouragement you need to go on. If you’re trying to help a grieving friend or family member, this book will help you develop more effective ways to meet his or her needs. Author and grief counselor Yvonne D. Osko hopes her book will touch the hearts of those who sincerely want to help the hurting. She delivers new insights, helpful suggestions, and solid advice for walking through the process of grieving. And Osko speaks from experience, “I’ve walked my own personal journey of grief following the death of my daughter by car accident in 1979 and death of my husband by car accident in 1992.” Written with the compassion of a grief survivor and the skill of a veteran counselor, The Unwelcome Journey is destined to become an indispensable resource for the bereaved and those who love them. In the book’s introduction, Osko writes: “There are many books written to the bereaved and many messages given about how the bereaved might try to deal with their loss. I have written The Unwelcome Journey with three special things in mind: (1) that the grieving soul might get a clear understanding that the thoughts and feelings he/she is experiencing are not just unique to him/her - but that many, many others are having feelings and thoughts much like what they are having; (2) that from the experiences of many who have travelled this unwelcome journey before have come some ways that seem to help us on the journey; and (3) that I may give some new insights to the Christian Community and others, so that they may develop more effective ways to ‘be there’ for the grieving friend or relative. Practical guide delivers help for surviving the grieving process. is published by Xulon Press. Xulon Press, a part of Salem Communications Corporation, is the world’s largest Christian publisher, with more than 3,200 titles published to date.